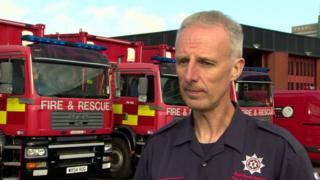 Image caption Firefighter Noel McKee said the two youths that attacked him and a colleague were "cowards"
A firefighter who was beaten with a bat as he and a colleague tried to extinguish a car fire has said he believes their attackers were on drugs. The attack happened on the New Lodge Road in north Belfast on 11 September. Noel McKee, who has been a firefighter for 28 years, said it was completely unexpected. "We had only just started to put the fire out when we were approached by two young men who in no uncertain terms told us to stop," he said. "We tried to carry on until they produced a baseball bat and once we had been attacked we knew it was time to get out. "We're pretty sure they were under the influence of prescription or non-prescription drugs." The car had been hijacked by two youths on the New Lodge Road and driven a short distance away before being set on fire. Image caption Mr McKee said that although he has been a firefighter for 28 years the job "still shakes you up"
Mr McKee said those behind the attack were cowards. "We got attacked as our backs were turned," he said. "My female firefighter colleague got hit with a large piece of masonry from close range and they threw an iron bar at us, some glass and some bricks." Mr McKee also said his colleague has not yet returned to work. "[She] suffered severe bruising to her right side. "That's caused her to be off now and she will be off for some weeks to come." He added: "We've all been doing the job for a lot of years now and it still shakes you up every time an incident like this happens."